Kuzan sat in middle of the cave. His forest was quiet, it was peaceful but still it was too quiet. Kuzan wondered what he should do should another adventure come tottering into his territory. Last time someone came he watched as they betrayed each other for the mere idea of gold. Kuzan chuckled. How foolish. "How far would a human go for a piece of gold?" He wondered out loud. He didn't know how much gold he actually had, all he knew was it made a nice nest. Kuzan hated to admit it, but he did enjoy when humans came into his forest... especially when he got to look at their face when they laid eyes on his nest. Kuzan chuckled. They would shove the gold into their pockets as if just having it would make them immortal. Their eyes would sparkle as they tried to steal it under the dragon's nose. Kuzan's body shuttered. That was what he lived for, the sight of envy on the faces of the foolish humans who dared to enter his domain. His eyes shifted from his gold to a stack of bones in the corner of his cavern. "At least those fools got what they wanted." But what did Kuzan want? Deciding that it was about time for Kuzan to begin to indulge himself, For the first time in years Kuzan crawled out of his cavern and began to take to the sky. His eyes blurred as it began to adjust to the sunlight. Once they adjusted Kuzan began to rise higher and higher in order to find a suitable prey to allow Kuzan to stretch his muscles. As he lifted into the air, he couln't hep but wonder what he might find hanging right outside of his territory. Aari was 12 now and was starting to near as big as she was going to get. Currently Aari stood at 16 feet high. She was strong enough and confident enough now to leave her father. This was actually the first time she had been away from them. She didn't plan on going far but next thing she knew she was lost. She traveled on and one trying to fine her way back home but with no luck. Her muscles tired and aching Aari landed on the forest floor to rest. Out of sheer dumb luck a pack of wolves was nearby that spot and a young small dragon looked like a good meal to them. Surrounding her they planned their attack. Aari wasn't worried though. The first one attacked and Aari caught it in her jaws before shredding it with her serrated claws. Dropping the dead fool of a wolf Aari prepared for the next wave in which 3 of them were attacking at once. Aari jumped into the air and breathed out a cone of frost freezing the wolves in place. Aari had however overestimated her ability. Landing on the block of ice that contained the 3 frozen wolves another wave of wolves was already ready to attack and Aari didn't have the time to compose herself for the next wave. All 4 wolves bit into her piercing her scales. Aari roared in pain and fell over onto the ground. The wolves around her froze up and only 4 more were left. Aari didn't feel like fighting them though. Jumping into the sky Aari tried to flee. She was losing a lot of blood though and before long she no longer had the energy to keep flying. The wolves tracked her location and prepared to finish off their prey. Thats when something awoke in Aari. Suddenly the grass and trees around her died replaced by water. The water came to her and formed a dome protecting her. She froze this dome for added protection. Just before the dome had closed around her Aari had noticed a large dragon flying in the sky. She hoped this stranger would help her out. Otherwise she may be doomed. She didn't want to die now she just found out she was a demi goddess. She had inherited one of her fathers powers. Plus she just plain didn't want to die. The forest shuttered as Kuzan flew threw the sky. Something was wrong. Kuzan's eyes narrowed as his leisure flight became a more alert and sped up toward the direction of the hatchling's location. Someone had intruded upon his territory. Kuzan roared. His words were carried upon the air, the trees, and the grass. It was if the forest and Kuzan themselves were one entity. "Who dares trespasses upon my territory!!!" The forest echoed. Kuzan's eyes narrowed as he scanned the forest. It wasn't long before he noticed a smaller dragon, no doubt a young-ling battling against a wolf pack. Kuzan would have chuckled at the sight of a dragon being pushed back by mere canines but right now he had more pressing matters to attend to. Then he saw something that changed his mood for the worse. He watched how the young dragon manipulated the plants turning them into water. How Dare You! he thought. He couldn't help but out another roar this one was strong enough to shake the earth the wolves were standing and the water surrounding the young dragon. Immediately his roar drew the attention of the wolves. Noticing the lord of the forest, the wolves quickly scattered moving away from the younger dragon. Landing onto one of the trees glaring at the young dragon Kuzan snarled. "Who are you and what do you are doing in my forest?" Kuzan shot. Most dragons knew to stay away from his forest, less they wanted to fight for their lives. Due to this he solemnly met anyone with enough gall to prance around and destroy his lovely forest, if they weren't human. So he stood and glared at the young dragon awaiting her answer. His claws were ready to tear her apart should she give him an answer he didn't like. A deafening roar echoed out and Aari figured it was from that dragon she saw earlier. She was relieved to know she was rescued. Now she had to break out of her ice dome. Breaking a hole through it Aari wasn't greeted by a very pleasant sight. The dragon who had supposedly saved her was now starring her down with a glare that could kill. He asked who she was and what she was doing here in an angry tone. Aari pulled her limbs in as if trying to appear smaller. She was very scared now. This dragon seemed very upset with her and he was really big. Out of the frying pan and into the fire. "I'm sorry" Aari said in a weak voice. "I'm lost I didn't know this was your territory." Aari backed herself back into her Ice dome trying to find some sort of protecting from this scary dragon. Ark was doing he usual patrol exploring the borders, it had been 5 years since his powers awoke. He was glad that his hatchlings where beginning to become more independent, especially Aari who had been through so much. As the sun began to set he suddenly felt a strange feeling of being threatened, due to his telepathic link to his children he could tell that Aari was in trouble. Atoning his senses he began his journey towards the child in danger, soaring over the Ocean he began to worry if he could arrive in time, and hoped that she wouldn't get hurt. Kuzan growled. "What are you some kind of frightened child? Come out of that ice ball." he boomed his powerful voice shaking the trees. Kuzan's eyes looked upon the ice ball in a twisted interest. 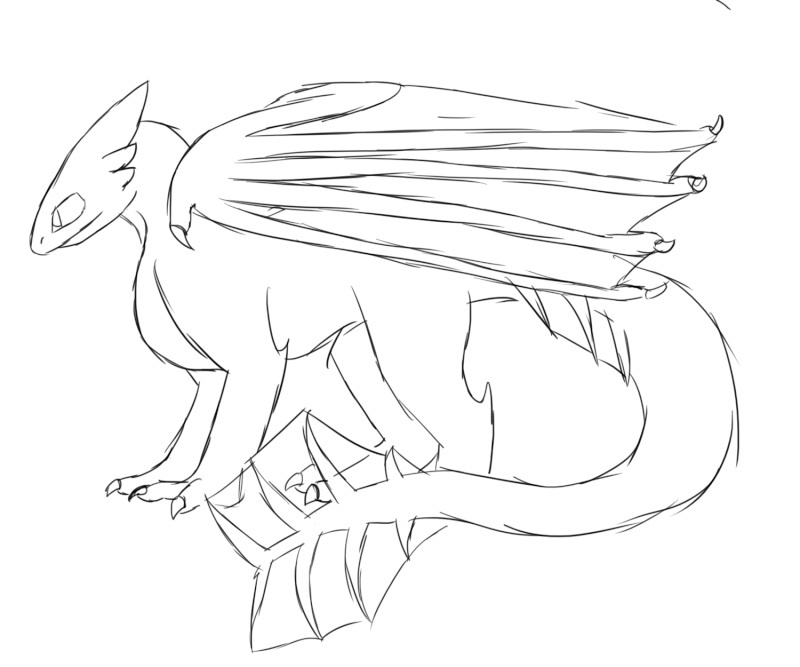 No creature, at least no icewing should be able to form a construct such as this at least without alerting him this much. Either way it mattered little to him, what did matter was what was this creature doing here. At the young one's statement Kuzan scoffed. "You didn't know? Your kind knows very well that this is my territory and that no one is allowed within my domain." He growled, looking down at the bodies of the frozen wolves, Kuzan couldn't help but show a look of sadness before snapping back and glaring at the young dragon. This was his forest, each and every creature that lived in it was his responsibility. He sighed. Looks like he was going to have a lot of work ahead of him when it came to re breeding the wolves and recovering the force that the dragon had killed. "You've tresspassed into my domain, wrecked my home, and killed my domain's inhabitants.Give me one reason I shouldn't tear your throat out and feed you to the wolves." he said with his deep voice. The scary dragon yelled at her and she only slunk back into her ice ball more. She backed herself up to the wall furthest from the small opening on the ice ball. The scary dragon then went on to lecture her about how she should have known. "I'm sorry I didn't know." Was her only response. Aari began tearing up over the verbal assault of this dragon. She wished she could teleport like her grandmother and teleport home. This is what she gets for leaving her fathers side. Whenever she finds herself alone bad things happen every single time. First she gets lost, then she gets attacked by a pack of wolves, and then a scary dragon hurts her feelings and threatens her. The scary dragon tells her all her crimes and then asks her why he shouldn't kill her. "I don't know please don't feed me to the wolves." Aari said in a shaky whimpery tone that revealed her emotional distress. After what seemed to be forever, flying as fast as he could he finally spotted a large green dragon close to a tree line. Straight away he knew that this dragon must have been the reason for Aari's feelings, It had started to get dark so visibility was starting to become an issue. He then saw the circular shape of an ice 'ball' thinking it must of been Aari he continued rudely entering the conversation, "Whats going on? Wheres Aari!" he snarled at the larger dragon, who was clearly in an aggressive posture facing the mysterious Ice shape. Shortly after he spotted Akreious who had always arrived. Nodding towards him in a greeting. Kuzan's eyes twitched as he felt two other dragons appeared before him. Was there some kind of gathering happening outside of his domain? Kuzan eyes narrowed as he noticed their appearance. Were they another pack sent to hunt him down? It looked to be two seawings and a skywing. Kuzan's body shifted. It wouldn't be the first time he would have to kill other dragons for intruding on his domain. Then one of them spoke, saying something about what the other dragon would have to do to leave safely. Kuzan opened his mouth preparing to give a response. Then he felt hostility being thrown at him. Looking at him was a seawing snarling. Kuzan couldn't help but chuckle at the poor whelp. The dragon seemed to be no older than 50 in human years, a youngin compared to Kuzan. It seemed that this one had no idea who he was, and what he had done. It was laughable. Kuzan merely ignored him and turned his attention to the other dragon. "Unless one of you can fix what she destroyed, I don't see any other way." he answered. Hearing the familiar voice of her father Aari ran out of her ice dome tears in her eyes and bad wounds on her body. She limped over to hide behind her father with what little strength she had left. She didn't have the energy to explain anything so she just cowered behind him. As Ark was gazing towards the immense dragon, he spotted Aari dashing towards him. He let out a smile happy to see that she was alive, giving her a nuzzle as she crept past him to hide from the intimidating dragon, he noticed the wounds on her straight away thinking that the other dragon had caused this, his rage burned within him but he kept calm. Turning his attention towards the Earthwing like dragon he couldn't help but notice that he was being mocked, he didn't like aggressive or bullish dragons, he thought as them for being weak having to resort to violence. He spoke with a growl, "Why is my daughter injured? I don't care for violence.. especially the strong picking on the weak" Trying to keep calm, to give Akre a chance to settle this peacefully. Ark would punish those who would hurt his family, so he glared at the other dragon almost like giving a warning. Meanwhile using his powers of healing he controlled some water nearby and applied it to Aari's wounds. Kuzan watched as the skywing flew off in order to try and fix the problem. Unfortunately the problem wasn't something that could be fixed with simple tools. Though Kuzan decided to wait and see how the skywing would try to fix it. Instead he heard the older whelp of a seawing growl at him. Kuzan looked at him and returned the gesture. "Your Daughter is injured because she thought it was appropriate to try to intrude into my home and try to hunt my pets and destroyed parts of my domain in the process." he stated pointing his nose to the frozen and dead wolves and the dead plant life. "Those wounds are proof that my pets aren't so feeble and easy to hunt." he said with pride. Then he went back to his mocking tone. "You say you don't like the strong picking on the weak? Don't you think your a bit mixed up little one?" Then his tone changed into a growl. "Your daughter perceived my guard dogs as weak and almost got hunted for it. I don't take kindly to intruders, especially when they cause a mess in my territory." He said in anger. Phantasmas has certainly been quite pleased with himself. Already he met a couple of dragons and took a liking to them, some he didn't like for obvious reasons, but nobodies perfect. Deciding to take a rest from flying, he landed somewhat near a forest when he heard what sounded a argument between dragons. Oh my, young dragons are always so hotheaded, though...it seems there may be some method behind the anger in their words as he crept up closer to where they were coming from. Hidden behind a couple of trees and bushes, he noticed a very large dragon, possibly a Earthwing, a Skywing, and two Seawings, one of the two a hatchling. So, thats whats going on here, the hatchling probably got separated from her father and stumbled into the large dragons territory by accident. Though....it seems like the large dragon wants something in return for intruding on his territory, how rude! This is exactly why he doesn't like these types of dragons, just because your bigger doesn't mean you can do whatever you want! He had it in his right mind to go show up this welp and make him apologize, though...he does have his own point. He took a quick peek and came back into hiding quickly, well, that sure put a damper on that plan. That ice dome...it gave the old dragon shivers, his power was useless in this type of situation with that ice there. That was his only advantage and only real battle strategy, deceive, wait, then strike at the right moment, its the only reason hes survived for so long, hes a not a bad fighter, just...he kinda doesn't want to become limp or well...dead. He stroked his beard as he thought of what to do in this situation, but he just sighed, "Well, seems I'm going to have to watch these events unfold then, what a downer." He said sadly as he seemed to almost age slightly. Perfect, now his own illusion was matching thoughts, well, might as well let it, if he does notice, might as well appear to be harmless.